The UK's longest established DPF Cleaning Specialists, we have been providing a DPF Cleaning Service since 2007 and established this website and resource in 2012, so we really are The DPF Cleaning Experts. The DPF or Diesel Particulate Filter is a strange beast, in reality it is a bodge by vehicle manufacturers to overcome emissions regulations, rather than reduce vehicle emissions, which would be quite costly and may not actually be achievable in the long term, Vehicle manufacturers developed a 'DPF Filter' that is placed in the exhaust system close to the engine which catches most of the soot and carbon that would normally be pushed out of the exhaust polluting the environment. This DPF eventually, often in as little as 2 weeks, becomes full and the Emissions Management Control Unit (often called the ECU or PCM) in simple terms adds additional fuel which passes through the engine and burns when it reaches the hot DPF and burns all the carbon in the process. This is the basic model anyway and is fine when everything is working correctly on your car, but quickly goes wrong and when it does the DPF and/or the Engine Management warning lights appear. 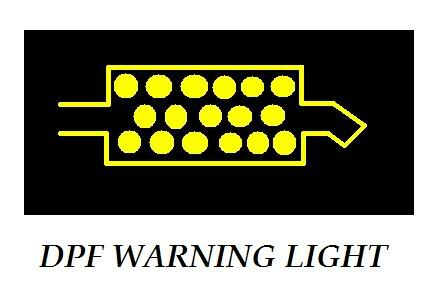 Like many others you have probably come to our website because the DPF light has come on, It often looks like this..
What can you do if the DPF light has appeared? The DPF light is a normal occurrence, the fact that it has come on means that you need to drive the car in a way that allows the DPF to clean (or regenerate) itself, Click here for instructions on how to clan the DPF on your car. This usually means that your car either has faults that are either preventing the DPF from cleaning itself or there have been too many failed attempts to regenerate the DPF and that further assistance is needed. You really need to have a specialist like ourselves determine the cause of the problem, once fixed the car may then be able to clean itself.